4C/8T Ryzen @3GHz and 24CU Vega @ 1.3 GHz on single chip with 8GB GDDR5. I really hope they sell these in the West! This would be a perfect entry level gaming PC. Its vega arch not polaris. I still wonder what happened to Mobile-Vega. How come there still are no design-wins for that, if there are for that Vega-Kabylake frankenstein? Is it produced at TSMC? The article mentions embedded but likely on package. That would probably mean an MCM i guess if true. But a board with gddr5 chips around the soc are more likely. The issue with package on package is that it is more difficult to get the heat out of the SOC die since the ram is on top of it and between the SOC and the heatsink. Also, dram cells starts to function worse when heated. With telephone and tablet soc not really an issue since these are low power, a mere few watts total for all the dies combined in the package at full speed. But with a desktop/gameconsole system running a sort of beefed up and modified ryzen 2400, that is going to be an issue for as far as i know. Even if it is just for example a 35W chip. Makes me wonder, if it is an advantage of an MCM being harder to reverse engineer in comparison to a motherboard with soc and separate dram. Also an MCM is harder to hack, i think because no pcb traces. And yes, edram is also on chip but that is low in amount of dram cells compared to modern GDDR4 and GDDR5 chips. Probably edram is build in such a way that it can handle the heat of the cpu next to it and it is next to the cpu cores, not on top of it. Still basically the same thing. At most vega is 5% better even with HBM or about one CU. nVidia pretty much has cornered the market for gaming laptops. Even Intel's marketing might is hopeless against it. It's probably not good enough to tempt OEMs, especially when you factor that the 11 series was probably intended to be out by now. 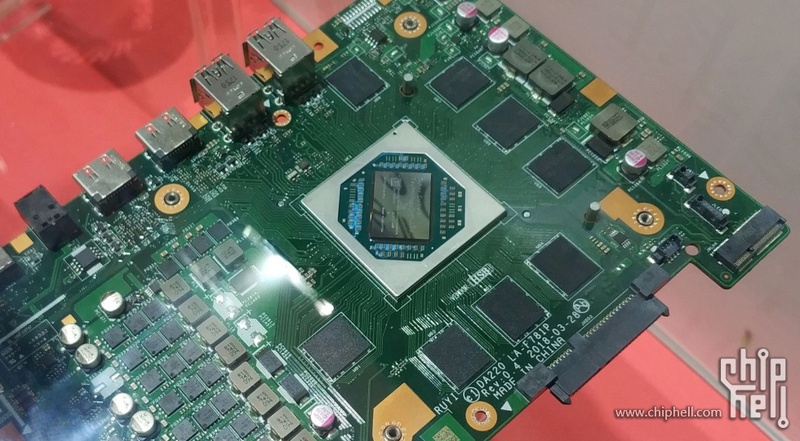 A Vega/Zen SOC with a GDDR5 interface. Check the update. No on package memory. nVidia pretty much has cornered the market for gaming laptops. Even Intel's marketing might is hopeless against it. Nothing to do with marketing. On the GPU Nvidia is simply better that's why. Vega is acceptable on desktops with worse perf/w, but that's a whole different story on laptops. Also imagine the cost disadvantage of a Vega M GPU with HBM2 versus GDDR5 GTX 1060. The problem is that no matter if you have a better GPU, if you don't have a CPU, you are royally screwed up. Intel is about to develop a decent GPU in 2 years and AMD has an offering too. What has nVIDIA on the CPU department? Also, VIA is trying to catch up on the GPU department and I won't be surprised if they works with Power VR to achieve that. Nvidia is so far ahead on the GPU front, as long as they keep it up I doubt they need to worry. They practically created the current DL market, and there's no competition to CUDA and GPU acceleration for workstations. Remember the Iris Pro parts? The discrete Nvidia parts beat them in battery life, in load power consumption, and of course performance. Nvidia wanted to basically kill the Iris Pro from the get-go so they priced it attractively too. Granted they were going against Intel, the company not known for cheap products. Kaby-G doesn't look like anything special either. They execute in a fantastic fashion, fueled by experienced well treated employees. The company has a high employee retention rate, something that Intel can't boast about(no doubt current problems are a result of this). Indeed, but Intel Iris Pro was done without any GPU department master. However now with Raja everything changes. They will relegate nVIDIA on higher tier machines. And both (Intel and AMD) would recommend the OEM to go with their solutions first besides nVIDIA even switching between them. Raja's team made Vega, which was not impressive at all. And some believe and propagate the conspiracy theory that Nvidia had to do with KBL-G systems being rare. No, the reality is KBL-G is a niche part. Battery life is like a discrete GPU system, and the whole thing is expensive. KBL-G is a better Iris Pro. Intel somehow missed out on the potential with KBL-G. The Vega part does not seem to be capable of shutting itself down when idle. They claim having it on package allowed power sharing to happen. Could they have not took extra time to turn off the GPU to improve battery life? No OEM will do this if the discrete Nvidia part is superior. They can do it for a while but eventually they'll decide not to. It would be interesting to see how it turns out. A 4 CPU core with about RX 560+ performance, would mainly be interesting for custom SFF entry level gaming. The main annoying part is it would probably be limited to 8GB of RAM (putting in 16GB of GDDR5 would probably up the price too much) and that is split between CPU and GPU. It actually looks like AMD isn't releasing the product at all yet. I would bet on the cost being the biggest factor, likely related to HBM pricing (possibly higher than projected when announced) making it uneconomical at this end of the market. Should beat down the XB1 XB1S and PS4. It should be on par or slightly ahead of the PS4pro on the GPU side with much more CPU power. Xbox one X has quite a bit more graphics punch and 4gb more ram but the 3ghz Ryzen should have about 50% more power over the 8 core Jaguar, but that side comes down to how well the operating system is designed. Interesting design and I'm sure it the basis for the next Xbox and PS design. As a console, this will never leave China, so that comparison is kind of moot for most people. Even in China, it probably won't do that well as a console. For most of the world this is mainly of interest as a SFF entry level gaming PC, which might see exports. As a PC the GPU power is almost in the middle between RX 560 and RX 570. Or between GTX 1050Ti and GTX 1060 3GB in NVidia terms, with a modern 3GHz quad core. So a solid little entry level gaming PC, but nothing super special on performance, just potentially nice small size for a decent price. Pricing and packaging would determine how good it is. But I certainly welcome more SFF entry level gaming machines. Competition would be things like the Deskmini RX/GTX. It is not Fenghuang Raven SOC. Fenghuang Raven has 28 CUs and HBM2 on the package.